We have several avenues for our B2C (consumer) customers to leave feedback on how they like particular Bell Performance products. They can leave feedback both on the Bell web site in the Product Section, and they can also leave product feedback at Amazon.com, the world's largest retailer. Recently, we got some great comments from one of our customers, James Corsey. 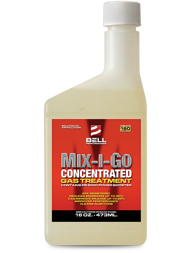 He's been using Mix-I-Go in a fleet of gasoline vehicles and appears to be highly satisfied. "I am delighted to make my comment regarding Mix I Go treatment. I have been using the product in my fleet now for years and have saved a lot of money on fuel and my vehicles are running great because of it. I would highly recommend this product to anyone that desires for their vehicles to give the the best performance." Thanks, James, for telling us your story!